Applies an adaptive threshold to an array. src – Source 8-bit single-channel image. dst – Destination image of the same size and the same type as src . maxValue – Non-zero value assigned to the pixels for which the condition is satisfied. See the details below. adaptiveMethod – Adaptive thresholding algorithm to use, ADAPTIVE_THRESH_MEAN_C or ADAPTIVE_THRESH_GAUSSIAN_C . See the details below. 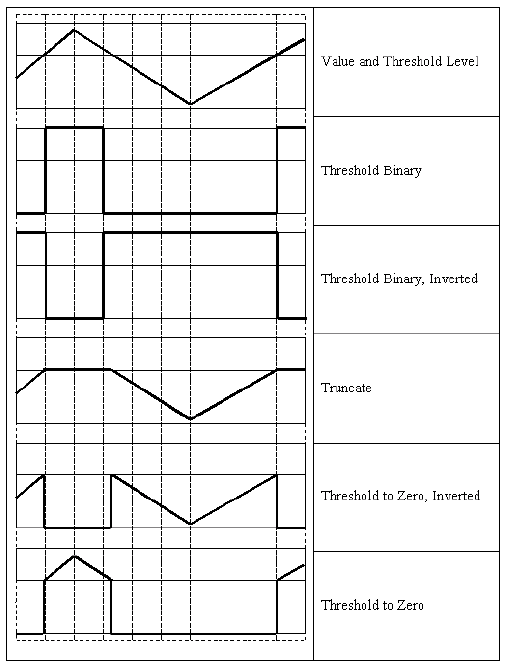 thresholdType – Thresholding type that must be either THRESH_BINARY or THRESH_BINARY_INV . blockSize – Size of a pixel neighborhood that is used to calculate a threshold value for the pixel: 3, 5, 7, and so on. C – Constant subtracted from the mean or weighted mean (see the details below). Normally, it is positive but may be zero or negative as well. where is a threshold calculated individually for each pixel. For the method ADAPTIVE_THRESH_MEAN_C , the threshold value is a mean of the neighborhood of minus C .
For the method ADAPTIVE_THRESH_GAUSSIAN_C , the threshold value is a weighted sum (cross-correlation with a Gaussian window) of the neighborhood of minus C . The default sigma (standard deviation) is used for the specified blockSize . See getGaussianKernel() . The function can process the image in-place. Converts an image from one color space to another. src – input image: 8-bit unsigned, 16-bit unsigned ( CV_16UC... ), or single-precision floating-point. dst – output image of the same size and depth as src. code – color space conversion code (see the description below). dstCn – number of channels in the destination image; if the parameter is 0, the number of the channels is derived automatically from src and code . The function converts an input image from one color space to another. 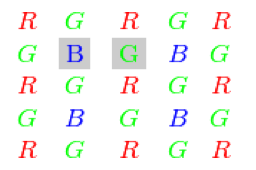 In case of a transformation to-from RGB color space, the order of the channels should be specified explicitly (RGB or BGR). Note that the default color format in OpenCV is often referred to as RGB but it is actually BGR (the bytes are reversed). So the first byte in a standard (24-bit) color image will be an 8-bit Blue component, the second byte will be Green, and the third byte will be Red. The fourth, fifth, and sixth bytes would then be the second pixel (Blue, then Green, then Red), and so on. If you use cvtColor with 8-bit images, the conversion will have some information lost. For many applications, this will not be noticeable but it is recommended to use 32-bit images in applications that need the full range of colors or that convert an image before an operation and then convert back. If conversion adds the alpha channel, its value will set to the maximum of corresponding channel range: 255 for CV_8U, 65535 for CV_16U, 1 for CV_32F. More advanced channel reordering can also be done with mixChannels() . , and cover the whole value range (in case of floating-point images, may exceed 1). Y, Cr, and Cb cover the whole value range. In case of 8-bit and 16-bit images, R, G, and B are converted to the floating-point format and scaled to fit the 0 to 1 range. If then . On output , , . RGB HLS ( CV_BGR2HLS, CV_RGB2HLS, CV_HLS2BGR, CV_HLS2RGB ). RGB CIE L*a*b* ( CV_BGR2Lab, CV_RGB2Lab, CV_Lab2BGR, CV_Lab2RGB ). RGB CIE L*u*v* ( CV_BGR2Luv, CV_RGB2Luv, CV_Luv2BGR, CV_Luv2RGB ). In case of 8-bit and 16-bit images, R, G, and B are converted to the floating-point format and scaled to fit 0 to 1 range. This outputs , , . The output RGB components of a pixel are interpolated from 1, 2, or 4 neighbors of the pixel having the same color. There are several modifications of the above pattern that can be achieved by shifting the pattern one pixel left and/or one pixel up. The two letters and in the conversion constants CV_Bayer 2BGR and CV_Bayer 2RGB indicate the particular pattern type. These are components from the second row, second and third columns, respectively. For example, the above pattern has a very popular “BG” type. Calculates the distance to the closest zero pixel for each pixel of the source image. src – 8-bit, single-channel (binary) source image. dst – Output image with calculated distances. It is a 32-bit floating-point, single-channel image of the same size as src . distanceType – Type of distance. It can be CV_DIST_L1, CV_DIST_L2 , or CV_DIST_C . maskSize – Size of the distance transform mask. It can be 3, 5, or CV_DIST_MASK_PRECISE (the latter option is only supported by the first function). In case of the CV_DIST_L1 or CV_DIST_C distance type, the parameter is forced to 3 because a mask gives the same result as or any larger aperture. labels – Optional output 2D array of labels (the discrete Voronoi diagram). It has the type CV_32SC1 and the same size as src . See the details below. labelType – Type of the label array to build. If labelType==DIST_LABEL_CCOMP then each connected component of zeros in src (as well as all the non-zero pixels closest to the connected component) will be assigned the same label. If labelType==DIST_LABEL_PIXEL then each zero pixel (and all the non-zero pixels closest to it) gets its own label. The functions distanceTransform calculate the approximate or precise distance from every binary image pixel to the nearest zero pixel. For zero image pixels, the distance will obviously be zero. When maskSize == CV_DIST_MASK_PRECISE and distanceType == CV_DIST_L2 , the function runs the algorithm described in [Felzenszwalb04]. This algorithm is parallelized with the TBB library. Typically, for a fast, coarse distance estimation CV_DIST_L2, a mask is used. For a more accurate distance estimation CV_DIST_L2 , a mask or the precise algorithm is used. Note that both the precise and the approximate algorithms are linear on the number of pixels. The second variant of the function does not only compute the minimum distance for each pixel but also identifies the nearest connected component consisting of zero pixels (labelType==DIST_LABEL_CCOMP) or the nearest zero pixel (labelType==DIST_LABEL_PIXEL). Index of the component/pixel is stored in . When labelType==DIST_LABEL_CCOMP, the function automatically finds connected components of zero pixels in the input image and marks them with distinct labels. When labelType==DIST_LABEL_CCOMP, the function scans through the input image and marks all the zero pixels with distinct labels. In this mode, the complexity is still linear. That is, the function provides a very fast way to compute the Voronoi diagram for a binary image. Currently, the second variant can use only the approximate distance transform algorithm, i.e. maskSize=CV_DIST_MASK_PRECISE is not supported yet. Fills a connected component with the given color. image – Input/output 1- or 3-channel, 8-bit, or floating-point image. It is modified by the function unless the FLOODFILL_MASK_ONLY flag is set in the second variant of the function. See the details below. Operation mask that should be a single-channel 8-bit image, 2 pixels wider and 2 pixels taller than image. Since this is both an input and output parameter, you must take responsibility of initializing it. Flood-filling cannot go across non-zero pixels in the input mask. For example, an edge detector output can be used as a mask to stop filling at edges. On output, pixels in the mask corresponding to filled pixels in the image are set to 1 or to the a value specified in flags as described below. It is therefore possible to use the same mask in multiple calls to the function to make sure the filled areas do not overlap. Since the mask is larger than the filled image, a pixel in image corresponds to the pixel in the mask . newVal – New value of the repainted domain pixels. loDiff – Maximal lower brightness/color difference between the currently observed pixel and one of its neighbors belonging to the component, or a seed pixel being added to the component. upDiff – Maximal upper brightness/color difference between the currently observed pixel and one of its neighbors belonging to the component, or a seed pixel being added to the component. rect – Optional output parameter set by the function to the minimum bounding rectangle of the repainted domain. FLOODFILL_FIXED_RANGE If set, the difference between the current pixel and seed pixel is considered. Otherwise, the difference between neighbor pixels is considered (that is, the range is floating). FLOODFILL_MASK_ONLY If set, the function does not change the image ( newVal is ignored), and only fills the mask with the value specified in bits 8-16 of flags as described above. This option only make sense in function variants that have the mask parameter. Color/brightness of one of its neighbors that already belong to the connected component in case of a floating range. Color/brightness of the seed point in case of a fixed range. Use these functions to either mark a connected component with the specified color in-place, or build a mask and then extract the contour, or copy the region to another image, and so on. Calculates the integral of an image. image – input image as , 8-bit or floating-point (32f or 64f). sum – integral image as , 32-bit integer or floating-point (32f or 64f). sqsum – integral image for squared pixel values; it is , double-precision floating-point (64f) array. tilted – integral for the image rotated by 45 degrees; it is array with the same data type as sum. sdepth – desired depth of the integral and the tilted integral images, CV_32S, CV_32F, or CV_64F. It makes possible to do a fast blurring or fast block correlation with a variable window size, for example. In case of multi-channel images, sums for each channel are accumulated independently. As a practical example, the next figure shows the calculation of the integral of a straight rectangle Rect(3,3,3,2) and of a tilted rectangle Rect(5,1,2,3) . The selected pixels in the original image are shown, as well as the relative pixels in the integral images sum and tilted . Applies a fixed-level threshold to each array element. src – input array (single-channel, 8-bit or 32-bit floating point). dst – output array of the same size and type as src. maxval – maximum value to use with the THRESH_BINARY and THRESH_BINARY_INV thresholding types. type – thresholding type (see the details below). Also, the special value THRESH_OTSU may be combined with one of the above values. In this case, the function determines the optimal threshold value using the Otsu’s algorithm and uses it instead of the specified thresh . The function returns the computed threshold value. Currently, the Otsu’s method is implemented only for 8-bit images. Performs a marker-based image segmentation using the watershed algorithm. image – Input 8-bit 3-channel image. markers – Input/output 32-bit single-channel image (map) of markers. It should have the same size as image . The function implements one of the variants of watershed, non-parametric marker-based segmentation algorithm, described in [Meyer92]. Before passing the image to the function, you have to roughly outline the desired regions in the image markers with positive (>0) indices. So, every region is represented as one or more connected components with the pixel values 1, 2, 3, and so on. Such markers can be retrieved from a binary mask using findContours() and drawContours() (see the watershed.cpp demo). The markers are “seeds” of the future image regions. All the other pixels in markers , whose relation to the outlined regions is not known and should be defined by the algorithm, should be set to 0’s. In the function output, each pixel in markers is set to a value of the “seed” components or to -1 at boundaries between the regions. Visual demonstration and usage example of the function can be found in the OpenCV samples directory (see the watershed.cpp demo). 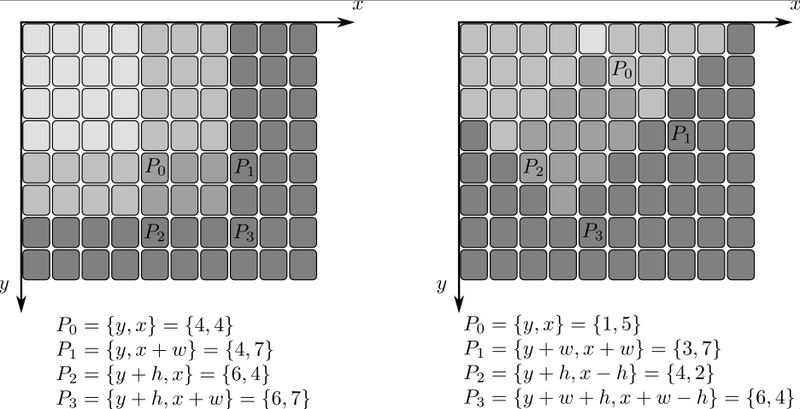 Any two neighbor connected components are not necessarily separated by a watershed boundary (-1’s pixels); for example, they can touch each other in the initial marker image passed to the function. img – Input 8-bit 3-channel image. GC_BGD defines an obvious background pixels. GC_FGD defines an obvious foreground (object) pixel. GC_PR_BGD defines a possible background pixel. GC_PR_FGD defines a possible foreground pixel. rect – ROI containing a segmented object. The pixels outside of the ROI are marked as “obvious background”. The parameter is only used when mode==GC_INIT_WITH_RECT . bgdModel – Temporary array for the background model. Do not modify it while you are processing the same image. fgdModel – Temporary arrays for the foreground model. Do not modify it while you are processing the same image. iterCount – Number of iterations the algorithm should make before returning the result. Note that the result can be refined with further calls with mode==GC_INIT_WITH_MASK or mode==GC_EVAL . GC_INIT_WITH_RECT The function initializes the state and the mask using the provided rectangle. After that it runs iterCount iterations of the algorithm. GC_INIT_WITH_MASK The function initializes the state using the provided mask. Note that GC_INIT_WITH_RECT and GC_INIT_WITH_MASK can be combined. Then, all the pixels outside of the ROI are automatically initialized with GC_BGD . GC_EVAL The value means that the algorithm should just resume. The function implements the GrabCut image segmentation algorithm. See the sample grabcut.cpp to learn how to use the function.